A solar cell is a photonic device, which is able to harvest the energy of light with specific wavelengths and turn it into electricity. The quality of a photovoltaic (PV) cell is depending on its energy conversion efficiency, which is the percentage of solar energy shining on the cell that gets converted into electricity. Current commercially available silicon PV cells range in between 12 – 15%. In June 2013 Sharp Corporation set the record for the World’s most powerful solar cell, based on a concentrator triple-junction compound, with an efficiency of 44.4%. A major challenge for traditional silicon based technologies remains the extremely high cost in processing the material. Intense research is hence focusing on the development of a low-cost, highly efficient solar cell that remains easy to manufacture. Among the different technologies for solar energy creation, dye-sensitized solar cells (DSC) represent a very promising, emerging technology and viable economical alternative. 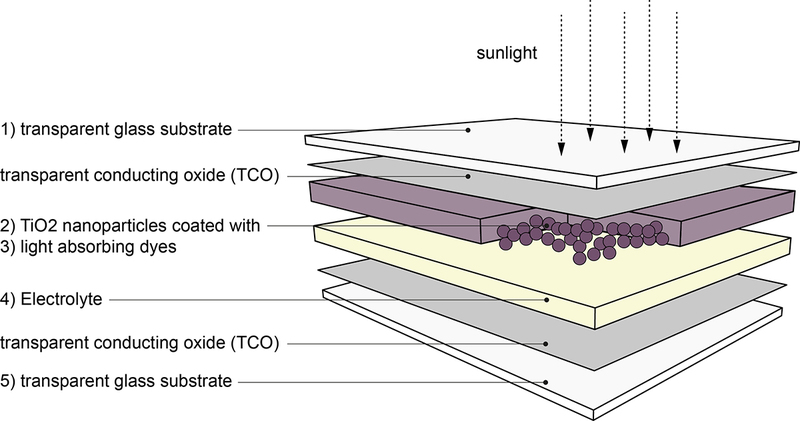 A DSC is a nanostructured photoelectrochemical device, consisting of a highly porous film of titanium dioxide (TiO2) particles, coated with a monolayer of dye that is sensitive to visible light. Similar to the chlorophyll in plants, which produces chemical energy, the dye has the role of absorbing solar energy and transforming it into electricity. The effect is hence often dubbed synthetic photosynthesis. DSCs are made from relatively cheap and widely available materials through simple and inexpensive processes. They can be transparent or differently colored, are lightweight and flexible and exhibit high power conversion efficiency even under low, diffused or indirect light conditions. 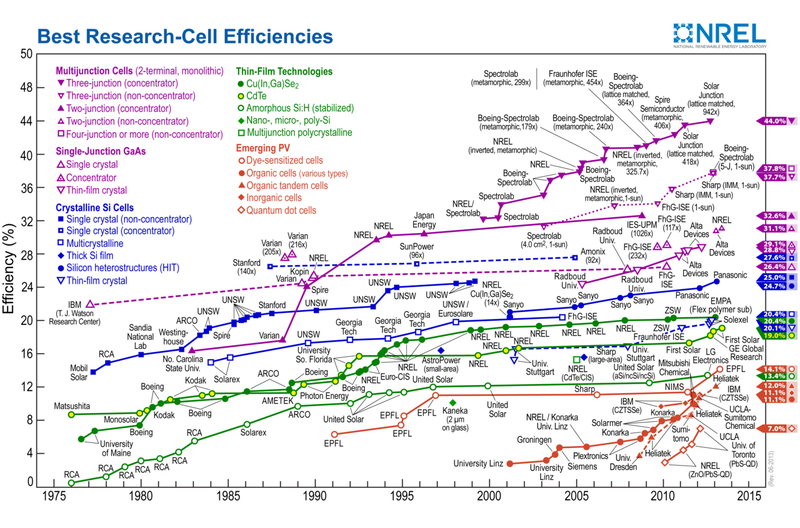 Overview of solar cell conversion efficiency improvement from 1976 until 2013 for different technologies. The photovoltaic effect was first discovered by French Physicist Alexandre-Edmond Becquerel in 1839 while observing the production of current between two platinum electrodes immersed in a halide salt electrolyte solution and exposed to light, an experiment that was strongly motivated by recent developments in photography. In 1883 the German photochemist Hermann Vogel discovered that through dye-sensitization of the photographic silver halides emulsion, which at that time was only sensitive to blue, violet and ultraviolet light, its sensitivity could be enhanced by adding small amounts of an aniline based dye, towards mid-spectrum and red light. Four years later, James Moser carried the concept of dye-enhancement over from photography to photoelectrochemical cells by using the dye Erythrosine. 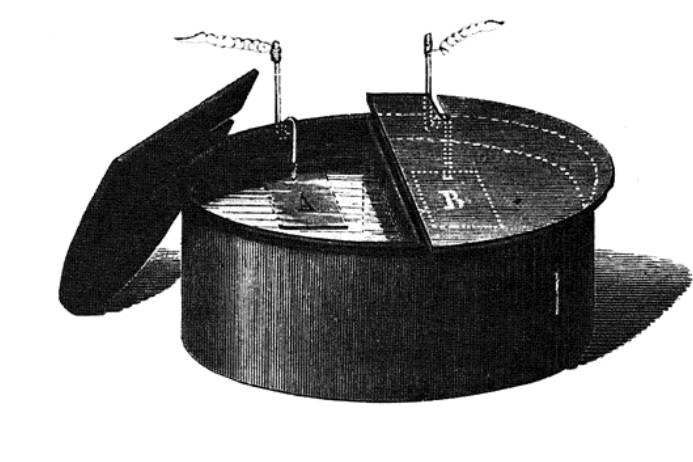 First photoelectric element invented by Edmond Becquerel, 1839. A Grätzel-Cell as produced by G24 Power. A direct link in between the two phenomena, photography and photoelectrochemistry, was presented by S. Namba and Y. Hishiki at the 1964 International Conference on Photosensitization of Solids, who used dye-sensitization on metal oxides (ZnO). In order to understand and simulate organic photosynthesis, the phenomenon was further explored at the University of California, Berkley in the late 1960s. In 1972 for the first time photons could be converted into electrical energy by charge injection of excited dye molecules into a wide bandgap semiconductor. While research continued the instability and poor efficiency of the devices (around 1%) remained a major problem. By introducing sensitized nanoporous Titanium Dioxide (TiO2) electrodes, which dramatically increased the light harvesting surface area, a conversion efficiency of 7.1% could be achieved in 1991 by Brian O’Regan and Michael Grätzel. Mid 2013 researchers around the group of Michael Grätzel at EPFL successfully created a state solid DSC version that raised the cell efficiency to 15%. During the same time, Yun Hang Hu, scientist at Michigan Technological University, developed a 3D graphene counter electrode in order to replace the relative expensive platinum parts without loosing efficiency. In August 2013 Researchers at Stockholm’s KTH Royal Institute of Technology presented a way to increase solar cell efficiency by 20% through the introduction of a quasi-liquid polymer-based electrolyte while just one month earlier scientists from the University of Basel developed a copper-based DSC where the relatively expensive element iodine had been replaced with the 50 times more abundant element cobalt. A typical DSC consists of five parts. The top part usually constitutes a glass substrate (1) coated with a transparent conducting oxide (TCO), often a fluorine-doped tin dioxide (Sn02:F) or indium-tin oxide (ITO). In order to produce flexible DSCs ITO-coated plastics have successfully been used instead of glass. The backside of the conductive plate is covered with a thin layer, around 10µm, of nanocrystalline TiO2 that acts as the semiconductor (2). The TiO2 forms into a highly porous (~ 60%) structure with a surface area that is over a thousand times larger than the projected surface area. Hence a 1cm2 film has an actual surface area of 1000cm2. The plate is then soaked in the dye (3), which forms a monolayer on the surface of the TiO2. Since the nanoporous TiO2 has a much larger surface area than a single-crystal layer would have, the amount of absorbed dye is dramatically increased and more solar energy can be captured. Two types of dye are generally applied, metal-organic complexes and metal-free organic dyes. The most common and efficient DSCs are currently based on ruthenium (Ru) dyes, however the limited availability of Ru complexes will eventually become a problem for large scale DSC production. A thin layer of iodide electrolyte (4) is then spread along the TiO2 and permeates its porous structure to form a redox mediator. The complete assembly is sandwiched together with the counter electrode (5), typically a platinum coated TCO glass substrate. The two glass plates are finally sealed to prevent leakage of the electrolyte and evaporation of the solvent. When the finished cell is exposed to sunlight the dye photosensitizer (S) on the TiO2 surface absorbs incident photons of sufficient energy. These photons stimulate the dye molecules from their ground state (S) to their excited state (S*). Next the excited electrons get injected into the conduction band of the TiO2 semiconductor, which in turn leads to the oxidation of the dye (S+). The electrons are then transported throughout the TiO2 layer towards the back contact (TCO) and finally reach the counter electrode through the external circuit. By reducing the oxidized S+ within the electrolyte it arrives back at its ground state (S) while the iodide redox mediator (I-) gets oxidized to triiodide (I3-). Finally the loop is closed when the oxidized redox mediator (I3-) restores its missing electron (I-) by diffusing towards the counter electrode. The fabrication of a DSC is relatively simple and DIY-Kits for school or class experiments are widely available. The TiO2 powder is a commercial product, which is usually applied on the TCO substrate using the Doctor blade technique or via screen-printing. In either case the films posses a thickness between 5 – 15µm and porosity of 60 – 70%. 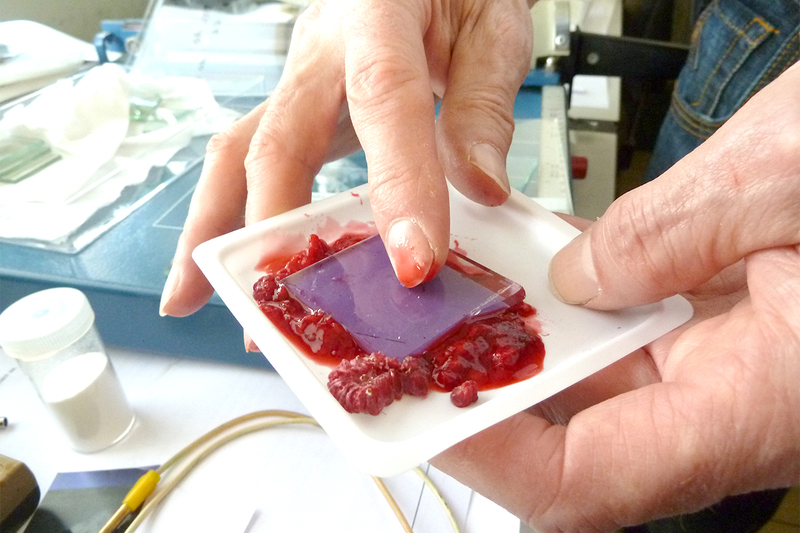 After the TiO2 film has been prepared it is immersed into the dye-solution and then stored at room temperature for 12 – 18h. This process results in intense coloration of the film, which is subsequently washed with alcohol to remove non-absorbed dye residue. The counter electrode is usually made by sputtering Platinum on a TCO substrate. The electrolyte solution is then dropped onto the surface of the TiO2 electrode and the two electrodes sandwiched and sealed together using a copolymer of ethylene or acrylic acid. In order to become commercially available and applied in a larger scale, DSCs still have to master a number of challenges. While conversion efficiency is continuously improved and already comparable with other PV technologies, a major problem remains the cell’s low stability. The cells need to be intrinsically and extrinsically stable towards changing temperatures, humidity and illumination for about 20 years with a loss of no more than 10 – 20%, which is what other common manufacturers guarantee. Moreover the low scalability, mostly due to the liquid electrolyte, of the cells poses a large issue when thinking about architectural applications. However, motivated by constant improvements, scientists are convinced to solve these challenges soon and a number of companies, including DyeSol in Australia, Solaronix in Switzerland and G24innovations in the UK, are already promising near-future market introduction of DSC technology. Due to their flexibility, transparency and lightweightness, they offer great potential for architectural applications, reaching from transparent or colored energy-producing skylights or windows to flexible curtains or membranes that could be used in temporary structures or emergency shelters. Their ability to work in low-light conditions makes them also particularly interesting for indoor usage or areas that are not constantly exposed to sunlight. The EPFL Swiss Tech Convention Center in Lausanne by local architects Richter-Dahl Rocha and Associates was in 2014 the World’s first prototype applying large-scale DSC technology into a public building. The West façade will include 1500 red and orange shaded 35 x 50cm solar power generating glass modules over a surface of 300m2. On top of the energy creating aspect (estimated at 8,000 kilowatt hours per year, which of course only makes a small part of the total building consumption) these elements reduce solar radiation and regulate the temperature inside the building, but most of all represent aesthetically interesting fully integrated building components. Stained glass elements of Swiss Tech Convention Center, Lausanne. 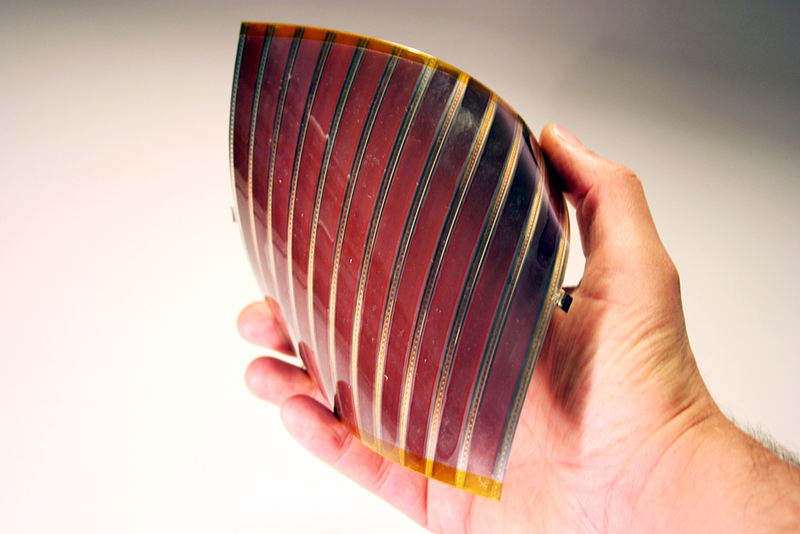 Sharp Press Releases, “Sharp Develops Concentrator Solar Cell with World’s Highest Conversion Efficiency of 44.4%”, June 14, 2013 (accessed Sept. 10, 2013). Junghänel, Matthias, “Novel aqueous electrolyte films for hole conduction in dye sensitized solar cells and development of an electron transport model.” (PhD diss., Freie Universität Berlin, 2007), 20. Grätzel, Michael, “Photoelectrochemical Cells,“ Nature 414, (2001), 338. Wenger, Sophie, “Strategies to Optimizing Dye-Sensitized Solar Cells: Organic Sensitizers, Tandem Device Structures, and Numerical Device Modeling” (PhD diss., École Polytechnique Fédérale de Lausanne, 2010), 15. Burschka, J., et al, “Sequential deposition as a route to high-performance perovskite-sensitized solar cells,” Nature 499, (2013), 318. Wang H, K Sun, F Tao, DJ Stacchiola, and YH Hu. “3D Honeycomb-Like Structured Graphene and Its High Efficiency as a Counter-Electrode Catalyst for Dye-Sensitized Solar Cells,” Angewandte Chemie (International Ed. in English). 52 (2013): 9210-4. Achari, Muthuraaman Bhagavathi, et al. “Quasi-liquid polymer-based cobalt redox mediator electrolyte for dye-sensitized solar cells,” Physical Chemistry Chemical Physics, (2013), 1. Bozic-Weber, Biljana, et al. “Copper(I) dye-sensitized solar cells with [Co(bpy)3]2+/3+ electrolyte,” Chemical Communications, Issue 65 (2013), 7222. Miettunen, Kati, Halme, Janne and Lund, Peter. “Metallic and plastic dye solar cells,” WIREs Energy Environ, (2013), 106. Barraud, Emmanuel. 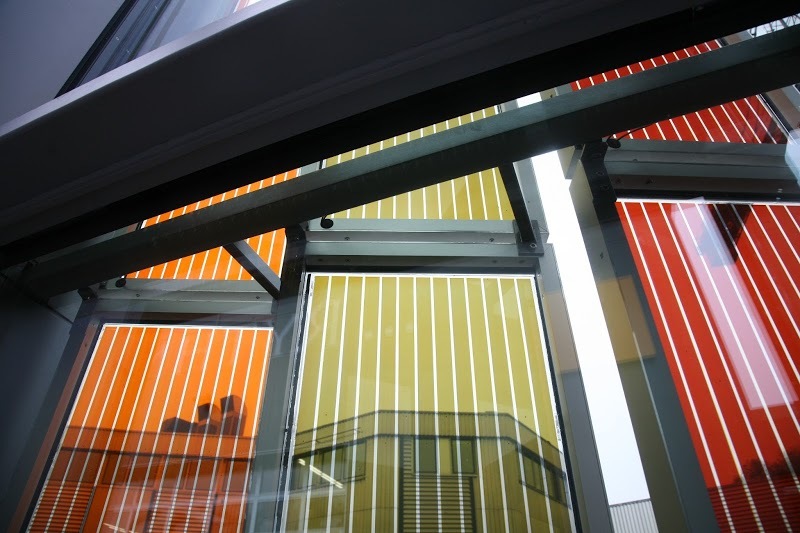 “Stained Glass Windows for the Swiss Tech Convention Center.” EPFL News Mediacom. (accessed Sept. 10, 2013).